1. 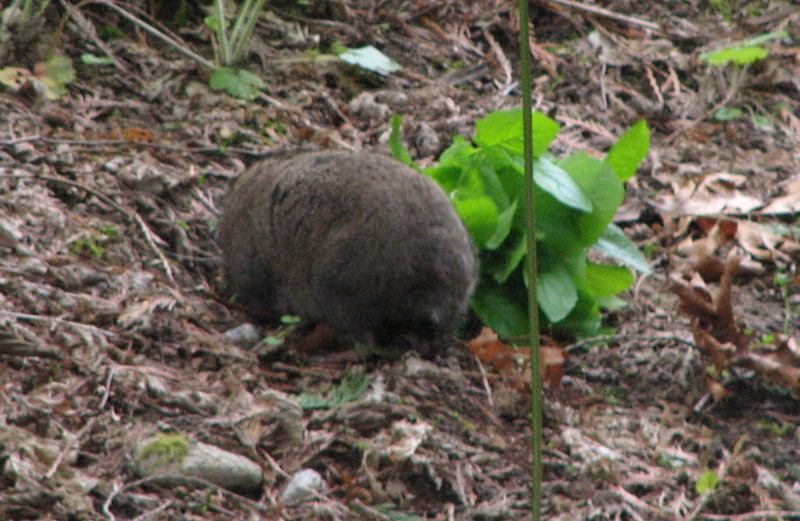 This mountain beaver (from 5/28/2009) has been the single-most viewed topic within this blog. 2. I have posted on this blog for a year already, without my noticing the anniversary on May 6th. 3. 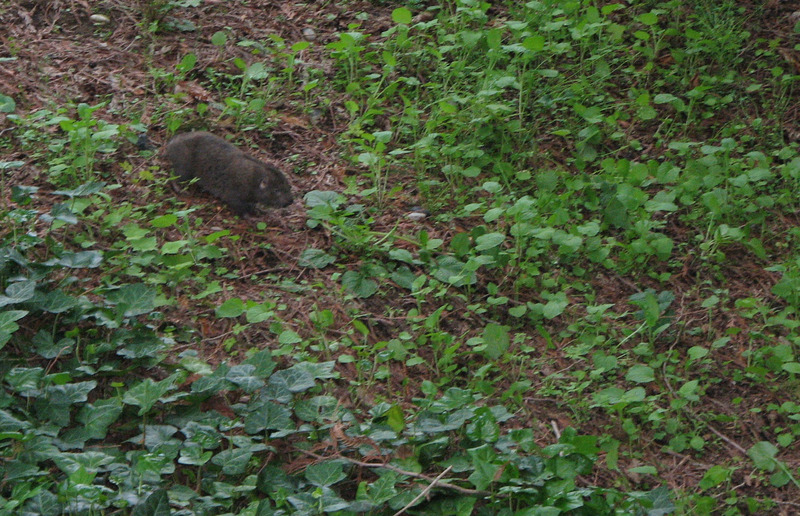 It must be springtime, because our resident mountain beaver is regularly visible again! All month, we’ve had a few passing peeks at the little guy. Last night I watched gleefully as he made a dozen or more trips back and forth from his burrow, in one door and out the other, then back to the first door, then out a third door, jaws full of bunches of leaves as large as his little football-shaped body. I got within just a few meters of him, and he paid me no mind whatsoever. He did freeze momentarily a couple of times when camera flashed, though. Enjoy the hardly-professional-but-still-fun-to-watch footage below! I even took a few videos! I went dashing for the camera and caught him trotting down the hill towards our huge western red cedar tree, which is ringed with a higher-than-normal growth of greenery down below thanks to our neighbors’ recent tree-massacre. A close-up. Isn’t he cute? He found some tasty green stuff and commenced to cutting. As he cuts, he accumulates the stems of the bunch in his mouth, for easy portability. The bunch ends up being larger than he is sometimes! 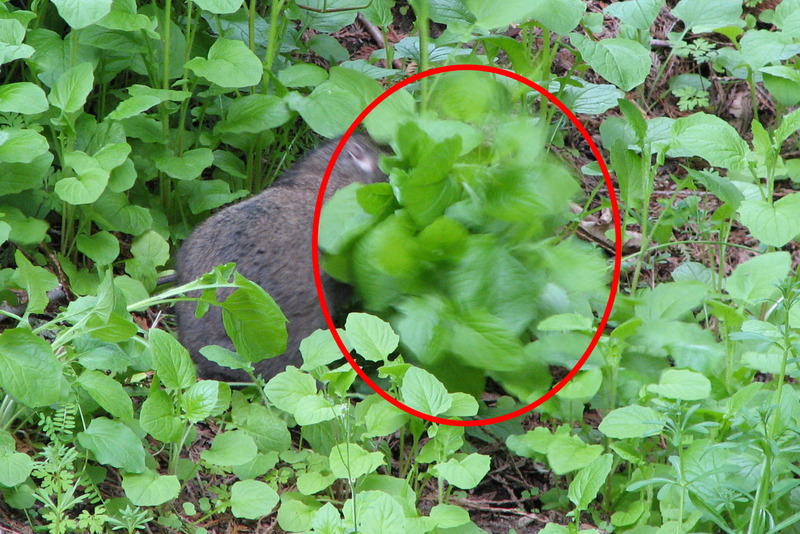 Blurry circled area below is the part he’s already cut, and it is blurry since that bunch moves around as he’s rooting around to cut the next stems. I’ve seen fewer tails cuter than that teeny nubbin – note the size of his dinner bouquet! Can anyone identify what kind of plants he’s cut? My husband and I were returning from a friend’s house, and as we drove on a residential street towards our house, we saw a furry-looking ball in the road about 100-150 feet farther down the hill. 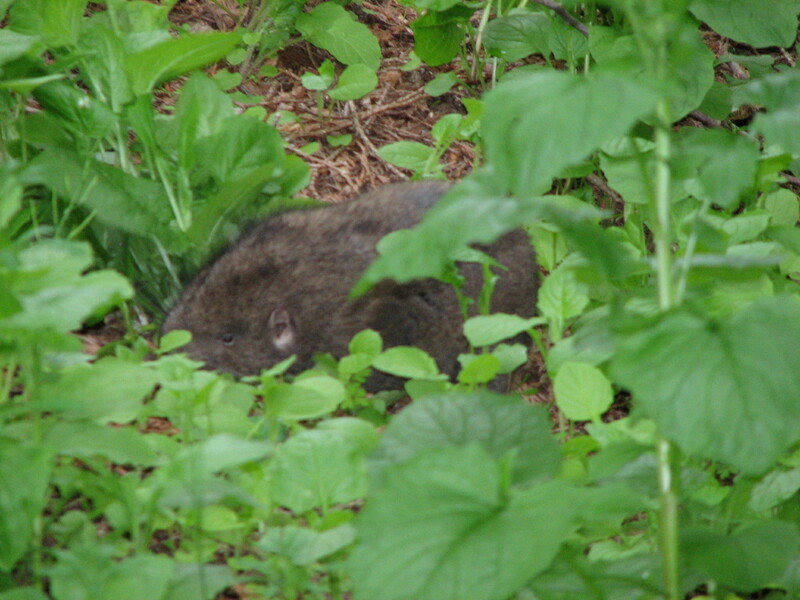 My husband said “It’s a mountain beaver!,” and indeed–it looked like it was. However, it didn’t move, even as other cars drove by more closely, so we discarded the idea. 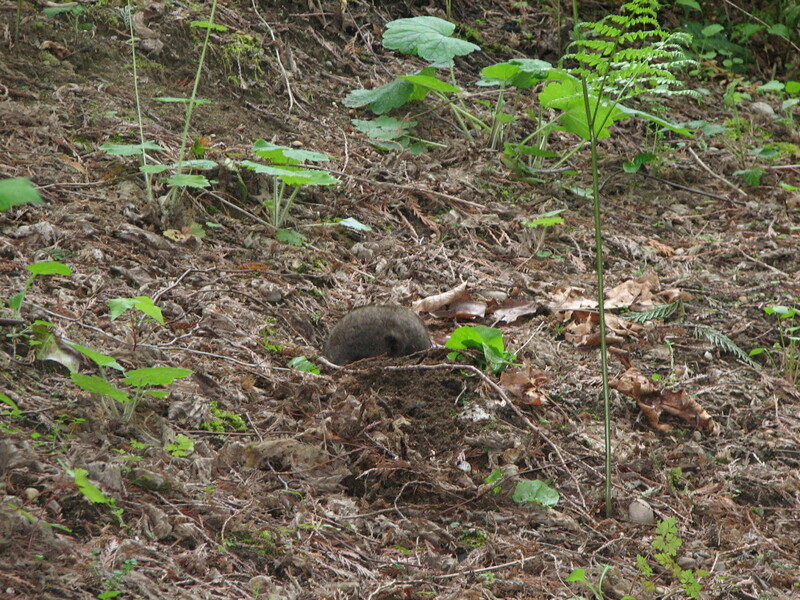 As we drove by, however, we slowed to check it out and it was definitely a mountain beaver. We guessed it must be sick or hurt if it just sat in the middle of the road like that, and my husband and I pulled off to the side of the road to figure out how we could at least help get the little guy out of the road. We approached with a rigid cardboard-and-fabric contraption that I happened to be carrying in the trunk of the car, intending on using it to scoot the poor little guy off to the grassy berm next to the road. 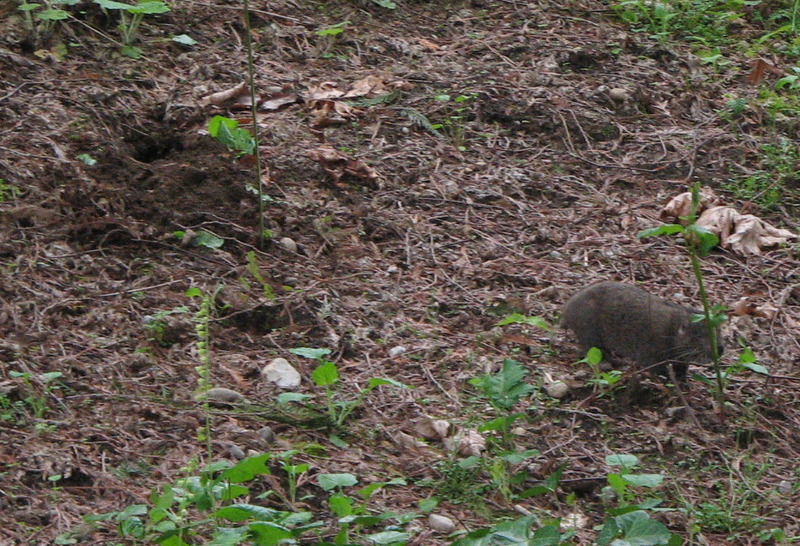 As we got nearer, the mountain beaver didn’t move. We brought the cardboard closer to him and he started, turning towards the cardboard and clicking his teeth together in agitation. Eventually we managed to get him to scoot off the road–he didn’t seem to be injured physically in terms of his mobility, and we don’t know why he was acting so dazed and letting us be so near for so long (~10 minutes). Perhaps he was struck by a car? Or poisoned somehow? 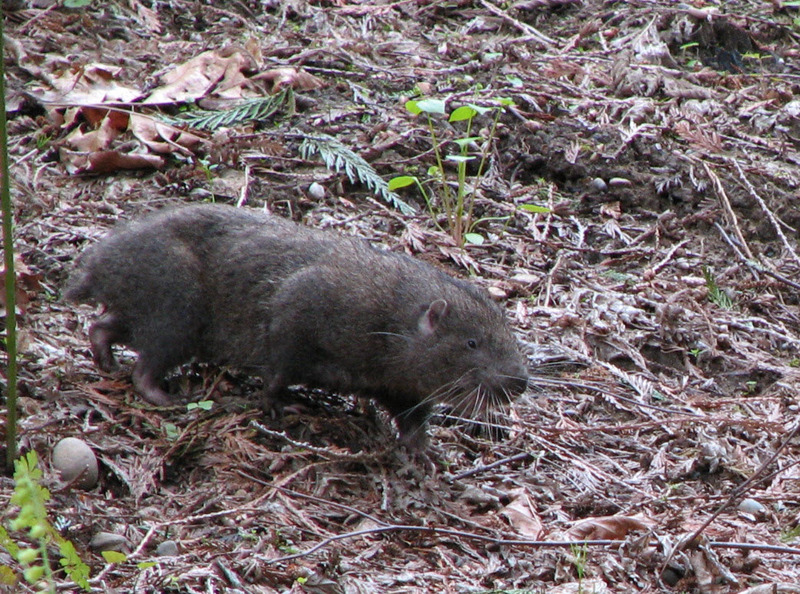 Here is a great site with tons of additional information about the mountain beaver. Since July 5th, there has been a 5,400% increase in traffic for the Mountain Beaver post I shared at the end of May. 5,400%!!! This guy is a veritable rock star, with 124 views in the last couple of weeks. As for my mysterious visitors, I’m dying of curiosity! Who are you? Where are you? Do you only come here looking for Aplodontia rufa? Or do you actually poke through the rest of the site, too? I invite your comments and salutations! We’ve seen him scurrying around back there four times already in the last couple of months. 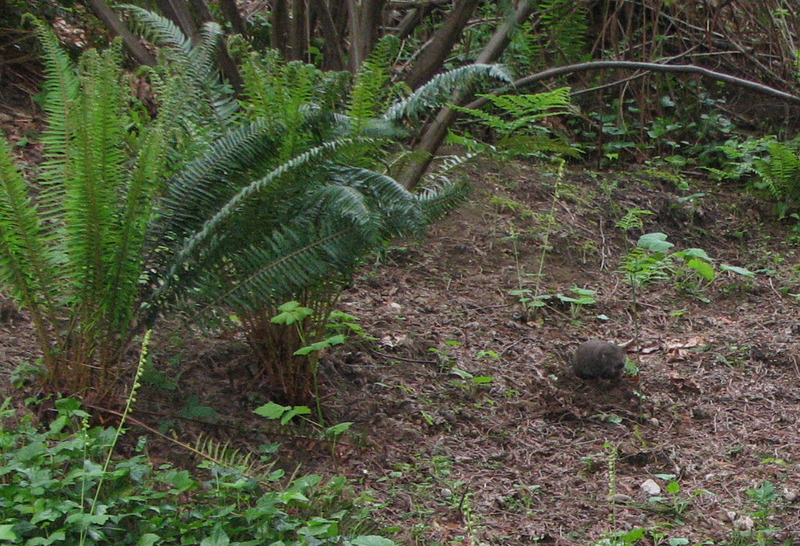 Each time, he pokes his head out, sniffs the air, then creeps out, cuts off a nearby piece of fern, and runs it like hell back to his burrow. 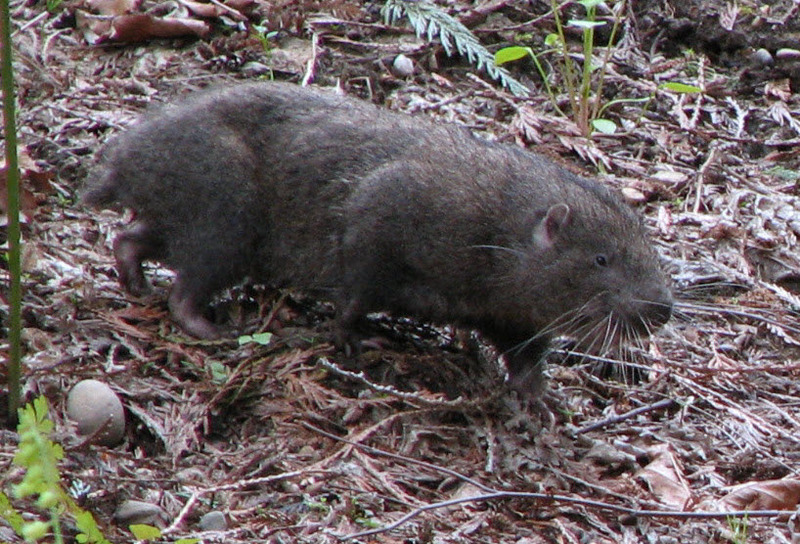 Wikipedia says that the mountain beaver, AKA Aplodontia rufa, is “the most primitive extant rodent” and a “living fossil.” And it’s in my own backyard!